If someone hurts or offends you, get over it quickly. Holding onto anger only distracts you from your walk in life and it serves no purpose in your journey. It is inevitable. You will be hurt by others, by strangers, by friends and by loved ones. There isn’t anything you can do to change what happened, so don’t allow negative thoughts to hold you captive. Don’t stay angry. 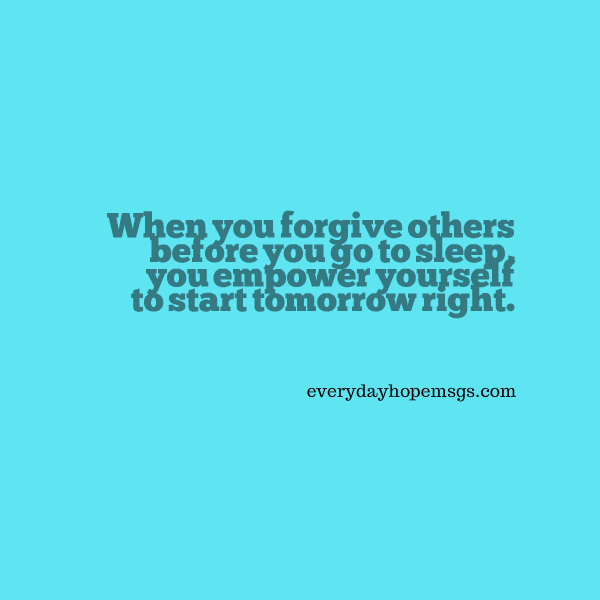 Forgive everyone before you fall asleep. Be generous with your forgiveness. Give it liberally. Give it freely and set yourself free from annoyance, indignation and anger. Acknowledge what happened and let it go before you go to sleep; empower yourself to start tomorrow free from hurtful emotions. Empower yourself to start tomorrow right.